Thermocouples are among the most popular temperature measurement instruments in industrial applications because of their versatility and ease of use. However, measurement errors can occur. This article discusses the six most common causes of thermocouple errors. Thermocouples are robust temperature measurement devices that are accurate enough for many industrial and scientific applications. Relatively inexpensive compared to other temperature measurement technologies, thermocouples are valued for their ability to measure a wide temperature range: from –200° to +1250°C (–328° to +2282°F). Thermocouples measure temperature differentials, not absolute temperatures. Two wires, each made from a different metal, are joined at the tip. This is the measuring junction. At the other end, the wires are connected to a body of a known temperature, called the reference junction. A thermocouple works by taking the difference in voltage between the two junctions, explained by the Seebeck effect. The measured voltage is converted into a temperature unit, with the temperature reading displayed on a device or transmitted to a remote location. You can run into problems if you choose the wrong type of thermocouple when inputting the settings into the transmitter during installation. This is a common error, as there are numerous types of thermocouples – types K, J, N, E, T, R, S, and B – each with a different range, accuracy, and electrical output. Solution: Almost all thermocouples are color coded by type, so you usually just need to confirm the color of the thermocouple jacket and match the settings on the transmitter. If you accidentally reverse the polarity of the thermocouple lead wires, the measured temperature will be incorrect by the difference in temperature of the two ends of the leads. The problem is understandable because red is the usual color for positive charges, whereas the red wire in thermocouple cables typically contains the negative signal. 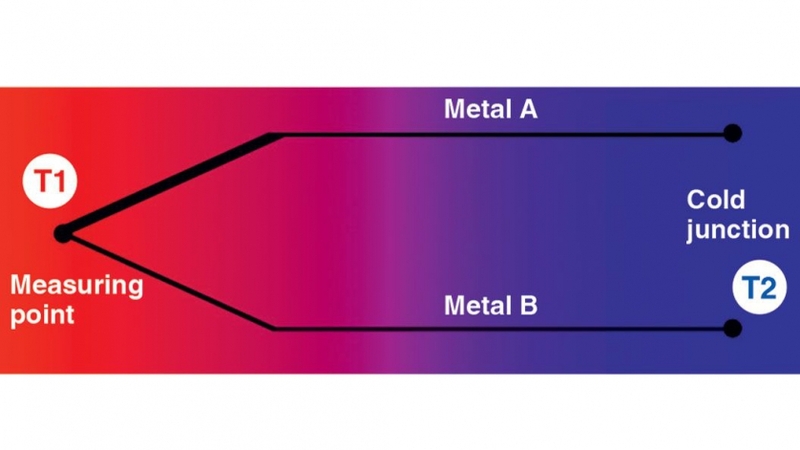 This coloration is ANSI standard for thermocouples, but it is not what most people expect. Solution: Doublecheck the connection and, if necessary, swap the thermocouple lead wires. No two batches of wires are exactly alike. As the alloy percentages vary a tiny bit during each manufacturing process, some error in thermocouple accuracy is unavoidable. Standard thermocouples get within approximately 1% of the actual temperature at the measuring junction, which is accurate enough for most applications. Solution: Order thermocouples with special-limit wires, which can improve accuracy twofold. These wires are manufactured at the highest tolerances to ensure the fewest possible impurities and the greatest consistency in alloy ratio. Because a thermocouple measures temperature differentials, any temperature fluctuations around the reference junction (cold junction), which has the known temperature, result in an erroneous temperature reading. Solution: Make sure no fans or other sources of cooling or heating are located near the reference junction. Simple insulation can also protect the junctions from extreme temperatures. A thermocouple should be grounded at only one location. If it is grounded at more than one location, a “ground loop” can be created with current flowing through the thermocouple from one ground to the other. This is likely to generate electromagnetic fields, which can lead to radio-frequency-interference-related problems that can impact measurement accuracy. Solution: Ground either the transmitter (connection head) or the controller/recorder, but not both. Selecting transmitters that have internal isolation between the input, output, and ground usually provides enough isolation to eliminate a ground loop. Loop isolators are also available and can be put in the loop wiring circuit to prevent this from happening. While thermocouples are reliable temperature measurement devices, they do drift with time. Maximum exposure temperature, cyclic measurements, and frequency of the cycles affect the metallurgy with a resultant drift, usually downward. Unfortunately, this drift cannot be predicted, but 10-20°F errors are common. Solution: The only solution is to periodically replace the thermocouple based on the user’s experience. You can learn more about industrial temperature measurement using versatile and low-maintenance thermocouples from this WIKA reference page.